Red Hot Stampers: Let the New Year Bling! Let the New Year Bling! Fill those cute tubes from September's Paper Pumpkin Kit with a few pinches of Fancy Frost Sequins! Just 1/3rd full is perfect for a midnight confetti toss! One of the benefits of being a Paper Pumpkin Subscriber is being able to order past kits! The Bermuda Bay Sequin Trim is wrapped around the tube and secured with a glue dot. Use the Star Framelits Dies and layer one inside the other to create this Blushing Bride Star outline. 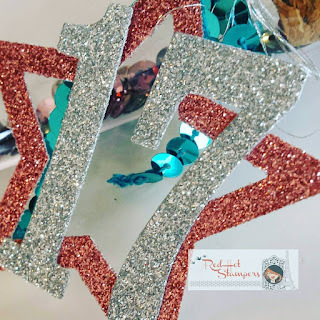 Layer the silver 17 with Multipurpose Adhesive OR glue dots if you don't have time to wait for it to dry! Wrap some silver metallic thread around the tube and tie the star to the tube. Now you're ready to "bling" in the New Year! Ways to Reuse, Recycle Christmas Cards!